Homepage. 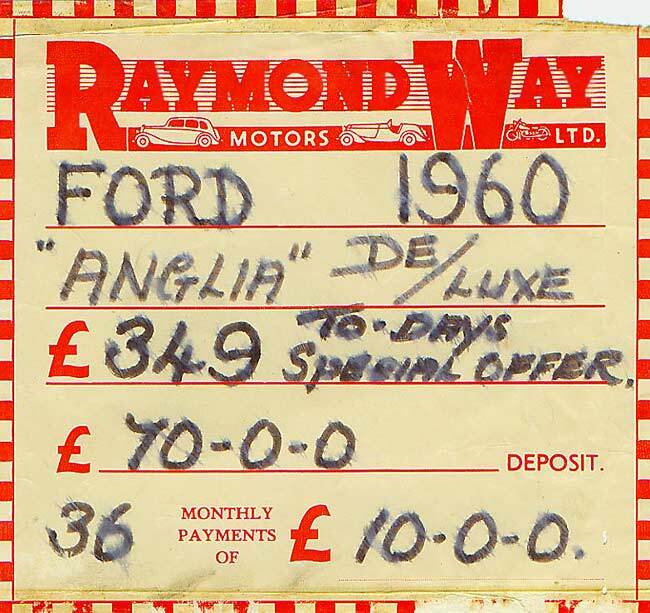 This page: Original screen prices for 1960's Fords, and recollections received from ex-employees. Raymond Way Ford Car Sales / Dealer. Another interesting pair of curios scanned and sent over by Les, this time found in a folder containing miscellaneous motoring items from the 1960s. They were used at the Raymond Way Ltd car dealership, advertising a 1960 Anglia on sale in the showroom. These unusual items are just the kind of thing that get thrown away, and therefore don't survive for long. Perhaps both screen displays were used in the same car - before and after a price change? maybe they came with a car that the purchaser bought, and these had been left in the window. The car was a 105E Anglia de-luxe saloon, from 1960. Searching around online brings up some references to a motor dealer of this name, based in Kilburn, London. He was the first person in the UK to place adverts on commercial television it seems. A Thames lorry of the early 1950s, in the livery of Raymond Way, can be seen on this page. 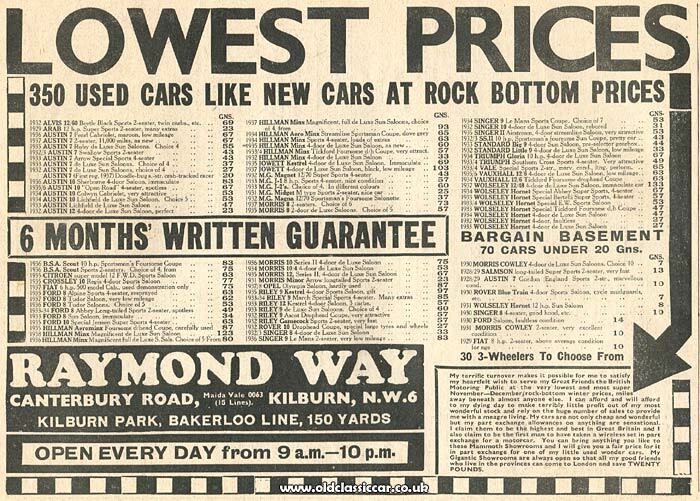 Cars on sale in 1938. As the following advertisement from July 1938 reveals, the company was in business for many years. This snippet demonstrates that there were plenty of cars to choose from at Raymond Way Ltd leading up to WW2. Amongst the more commonly-found makes and models, are a few rareties. These include Alvis 12/60 Beetleback, 1929 Arab 12hp Super Sports, Crossley Regis 10hp, SS2 Coupe, Vale Special, and a Salmson Super Sports. Sale of a VW Beetle in 1963. "I've come across your Old Classic Car website following a Google search. That search was for Raymond Way Motors which led me to this particular page of your site. The page appears to mention Brian Davies [further down this page] who was an employee back there in the '60s. I was wondering if he is still around if you could put me in touch? The reason I ask is I have just acquired a 1963 VW Beetle and I'm trying to find out as much about it as I can, and to see if the original owner is alive. 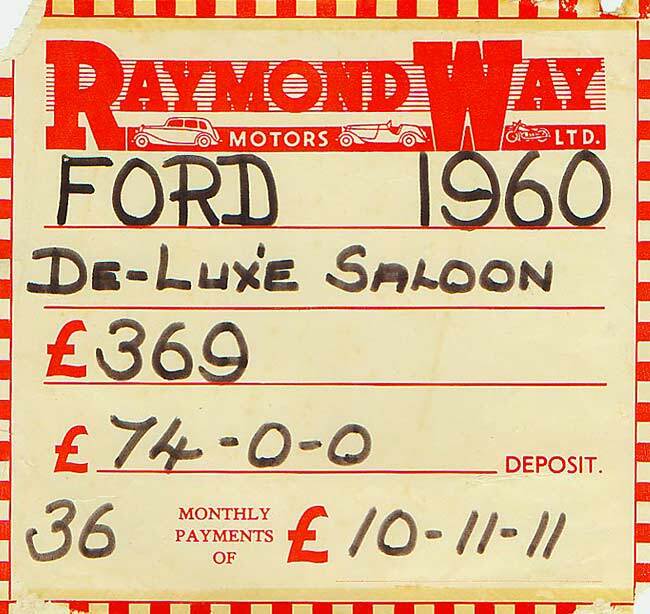 My main reason for buying it is the history file from when the car was sold which includes the original (attached photo) invoice, which you will see is from Raymond Way Motors. 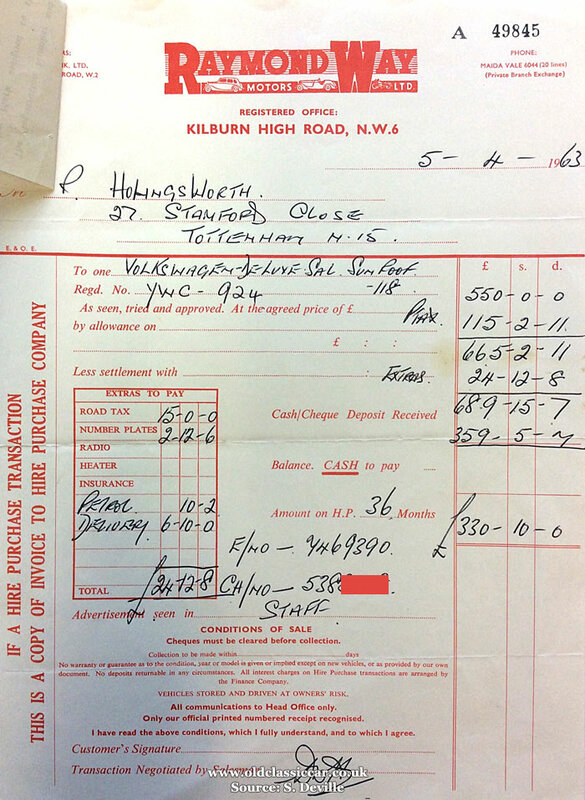 What is also interesting is it mentions Staff on the invoice which makes me think it may have been a staff purchase, and he may know Mr P Holingsworth therefore. Any chance to contact him would be greatly appreciated." If anyone who worked for the company knows who the VW's buyer (Mr Holingsworth, or more likely Hollingsworth) was, please get in touch and I'll forward the info. The Beetle's registration is YWC 924. Apparently, Essex Records Office in Chelmsford have archives for motor vehicle registrations, beginning in 1904 and running well into the 1970s, so it would be worth contacting them also regarding the car's early years. Good luck with the search Steve. Raymond Way employees get in touch. A former salesman looks back. "Browsing through the web today, I came upon a couple of on-screen For Sale notices for a 1960 Ford Anglia which had been posted by a chap called Les. He had come across these old handwritten notices in a folder containing various motoring docs. My name is Brian Davies, I worked at Raymond Ways at this time as a salesman, and knew very well the chap who wrote out these sale notices, his surname was the same as mine, so I went under the name of Bryan. I would love to hear from anyone who can remember anything pertaining to any staff member of that era, or anything to do with Raymond Way Motors. At my time there we also supplied the cars for the television series Z Cars, had an aviation dept, and even had a Piper aeroplane in our showroom in Kilburn high street. There was a motorcycle dept (where I first worked), and a three wheeler dept to boot. Hoping to hear from someone, I am expectantly, Brian Davies. PS, To hear from Frederick Way ( junior!! ) would be absolutely fantastic." Quite an elegant lady, well dressed, complete with umbrella and picture hat, entered the showroom in Canterbury Road (before we were installed in our posh new showroom ) and proceeded along the aisle between the rows of cars. She was not (seemingly) considered to be a potential buyer, and so was allowed to proceed unmolested. However at a certain point she lost her footing and fell to the floor. A salesman rushed to her assistance, put his arms beneath her shoulders and began to lift her up on her feet again, but at this point she unfortunately audibly broke wind, without further ado, the salesman dropped her like a sack of potatoes, and cried out "FILTHY B*TCH". Just picture the scene, elegant lady, hat askew in a crumpled heap." "Another time in our little rest room in the Kilburn High Road showroom, I happened to be inbetween one of our salesmen named Ray St Bernard (who had been a very well known wrestler) and a friend of his who was also very famous, a wrestler named QUANGO. Quango had a fantastic body, but was not a pretty boy to look at, anyway Ray saw fit to shout out loud "what do you mean he's the ugliest man you've ever seen". Imagine how I wished to be swallowed up in a hole. I would like to add that Raymond Way was a most impressive man, who commanded attention wherever he went, and had - what I have always called - "presence", a truly remarkable man." "We had a general helper who went under the name of Paddy O'Connor, he would fetch and carry, and do all sorts of helpful things, anyway would you believe he bought himself a Packard straight eight convertible, which was - apart from a dent in the front offside wing - quite beautiful, but was unable to afford to run it. Now comes the crunch - he offered it to anyone of us for 25 pounds, but no-one took it up, so this beautiful machine went to a breakers yard. I have a black and white photo of this beauty should you evoke any interest, also in my posession I have photos of the Rolls-Royce used in the film "The Millionairess" which was owned by Raymond Way. Incidently I took, developed, and printed, all the handout photos of the cars we hired out for the "Z Cars" series." Cars used for TV work. "I have a bit of additional information. My Dad was Bert Davies who I am sure worked with Bryan Davies in the early to mid sixties. Bert (Herbert) was Sales Manager at Raymond Ways and had an office at the rear of the front showroom which, if my memory is accurate, was where new cars were displayed. His main responsibility was second-hand cars which were shown in a huge showroom at the bottom of a slope behind the new car frontage on Kilburn High Road. The showroom appeared to be twice as big as it really was as the end wall was covered in mirrors." "Bryan was quite right that the firm rented cars out for TV and film work including "Z cars" and "Our Man at St Marks". Although still at school I spent many a happy Saturday morning with Dad just being around the cars. In addition to the Ford Anglias that the windscreen stickers refer to, I recall E-types, Metropolitans (with their awful Pye radios), an Austin Atlantic and a Volvo P1800 from the very large stock that they carried. After I passed the test at 17 I drove a variety of cars to film sets and TV locations, including Donald Sinden's A35 for "Our Man at St Marks". I have very little recollection of other people who worked there apart from "Mr Frederick" (Raymond Way's son), Brian (or Bryan) Davies and various traders, including Stan Bates who I believe had also been sales manager before Dad. I have very fond memories of Raymond Way's although I see from Google maps that the premises have now been redeveloped for housing and the Rifle Volunteer on the corner of Brondesbury Villas and Kilburn High Road has become a gastro pub. I came across Bert's business card the other day - funny the things you hold on to. Maybe this email will revive a few more memories for Bryan." My thanks to Roger for sending over his recollections of this once well-known firm. A motorised elephant and more. In late 2013, two more people with first-hand recollections of the firm got in touch, starting with Richard, whose father worked there after WW2, then Ann who worked there in the early 1950s. I wonder if the motorised elephant that Richard refers to was one of the Ford-sidevalve powered creations that I've read about in the past? "I read with some interest articles by Brian Davies and Roger Davies (no relation apparently!) concerning the massive Raymond Way car dealership in Kilburn, London. My father was Fred Netts, who worked in the spray shop from soon after World War 2 and subsequently became the manager of that department until the company was taken over (by Moons Motors?)." - A full sized mechanical elephant, which I recall my father saying broke down continually. The complex mechanicals were covered in a grey felt material, fascinating to a schoolboy such as myself. - Hermann Goering's bullet proof Mercedes. I remember being unable to move one of its massive heavy doors. - An American Convertible with a solid electric roof, Iâ€™d never seen anything like this at the time. It had appeared on TV and the bonnet was badly scratched from the high heels of dancers who had to scramble aboard." "I have just found your site whilst looking for something else, and like the page concerning Ray Powell Ltd. It was good to see, as I worked for the Company in the office about 1952, at the Romford Road branch. At that time Mr. Ray, as we had to call him, had a car hire business a few shops along from the main showroom. The main company, with large workshop at the rear, was managed by his son Stuart Powell. This main company was then called R.P. Powell Motors Ltd. If you know of any photographs of the place, I would be thrilled to see them. What memories this brings back to me. Thank you for listening to me rambling on." If anyone else worked for this motor retailer, and has memories of working there, please get in touch and I'll add them in here. In later years the company would be taken over by King's of Oxford as part of their business expansion.